In what is no doubt its final stop, the original Darksiders returns one last time on Nintendo Switch. Available across many platforms past and present, Darksiders is a wonderful action game in the style of The Legend of Zelda or even Legacy of Kain: Soul Reaver, albeit with post-apocalyptic trimmings. There are puzzles, dungeons, combat and more packed in here and of the three games in the series, it remains my favorite. So how does it fare on Switch? The results are pleasantly surprising. Darksiders was first released in 2010 for PlayStation 3 and Xbox 360 but while it’s a wonderful game, there’s no doubt that it has a series of technical flaws, and performed poorly on both, with only the the subsequent PC port delivering the goods… until late 2016 that is, when Darksiders received its Warmastered Edition upgrade. This is essentially a creditably remaster for PS4, Xbox and PC, with upgraded assets and a smooth 60fps refresh. And then, months later, Nintendo fans received their own version – on Wii U. That was a strange release bearing in mind that the Switch was already on shop shelves. Now, almost two years later, the Switch receives its own version of the game that in terms of its visual make-up and presentation falls somewhere between the Wii U and current-gen editions – and what’s welcome is that both performance and quality modes are available. Quite how they present all comes down to whether you’re playing in docked or portable mode. With its higher GPU clocks, Darksiders when docked delivers a full 1080p in quality mode, but caps frame-rate at 30fps, with even frame-pacing. However, switching to performance mode sees the game double its output, with resolution dropping to 1440×810 – a perfectly fine compromise. When playing in portable mode, the 30fps quality mode runs at a full 1280×720 to match the Switch’s native resolution, while the cost of targeting 60fps is a resolution drop to just 540p. This video analysis of Darksiders on Switch shows you everything you need to know about this intriguing port. When toggling between the two modes you may notice that the resolution change applies equally to text and HUD elements. The entire user interface renders at whatever resolution you’re using which means playing at 810p while docked yields blurrier text all around. The docked mode also includes improved anti-aliasing over portable and slightly improved texture filtering, though texture filtering is poor throughout. The options menu also allows you to disable the vignette option and chromatic aberration – music to the ears of many who dislike these post-process effects. In the case of Darksiders, however, I prefer these effects myself as they help smooth out and conceal the often low-polygon environments. The choice is yours, however. When compared against the PS4 Pro version of the game, the results are interesting. In general, the two versions are similar in the ways you might expect. The core assets including textures, character models, scene geometry all appear pretty much identical at a glance, but if you start looking closer, you may spot some strange differences. The most obvious variance stems from resolution and texture filtering, both of which are reduced from the PlayStation 4 version. However, the Switch version has a slightly washed out appearance – something unseen on the last-gen versions as well as the other Warmastered upgraded releases. Still, despite this, the game looks better overall than the 2010 original and features the remastered assets throughout. The Switch’s frame-rate outlook is impressive overall, particularly when it comes to the performance mode, where the 60fps target is met in many scenarios. Intense boss battles can drop into the 50s, but it holds up overall. Exploration is pretty much flawless with a solid lock, though adding monsters to some of the environments (even if you’re not fighting them) can see some substantial drops. It’s not as solid overall as the current-gen versions, but pretty good overall. If you opt for the quality-focused 1080p30 mode though, frame-rate is solid with just the odd minor single frame hitch. Undocking sees a very similar outlook to frame-rate overall. The performance mode mostly hits 60 frames per second, but you’ll run across dips in certain areas. The loss in resolution down to 540p is extremely obvious though, but it’s a trade I’ll take as Darksiders just feels great running at 60fps. As you may expect, the quality mode delivers the expected 30fps frame-rate with improved image quality. It does look impressive on the Switch screen but I prefer the 60fps mode myself – it just feels better to play. What I think is worth stressing though is whether you’re playing on the go or docked, both options are a substantial improvement over the old PS3 and Xbox 360 releases, and even the 2017 Wii U edition. But perhaps not surprisingly, the results are more impressive on the other current-gen versions of the Warmastered Edition. 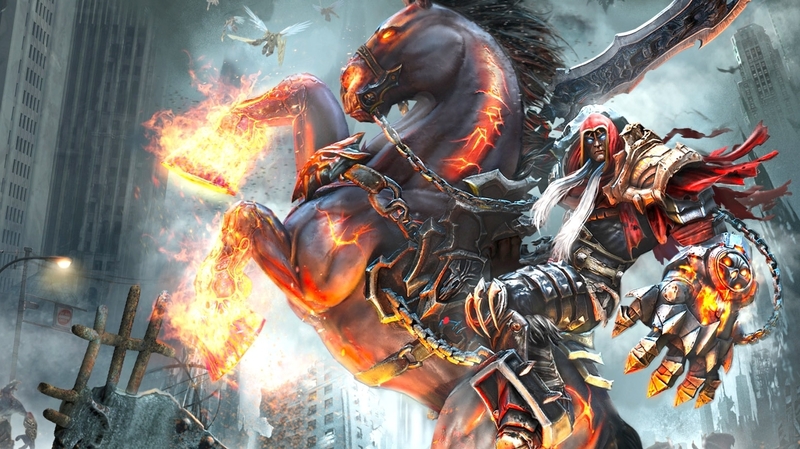 And honestly, Darksiders is still a great game that holds up better than you may expect. It was never a gorgeous game to begin with but the stylised approach to its visuals helps to prevent it from feeling dated. My main complaint remains the nature of the game’s introduction – the first 30 minutes fail to represent the nature of the gameplay. You might think this is more God of War than Zelda based on this segment but that’s really not the case. Stick with it and you’ll quickly discover that this is a standout release that’s well worth revisiting. It may not be the best version of the Warmastered Edition, but it’s surprisingly close, handheld works beautifully and the fact that it’s such a huge improvement over the last-gen versions definitely makes it worthy of the Warmastered name.